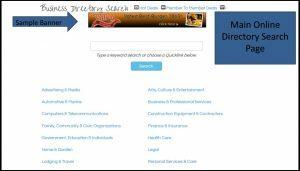 Advertise your business here on the Chamber web site. Contact Amy Alexander for options and pricing at 972-792-2812 or amy@richardsonchamber.com. Get your business in front of the thousands of people on the Chamber's weekly calendar emails. Whether you choose to include an articles, member news, or want to just place an ad or logo in the left column, you'll get the word out to lots of eyes! Advertising in the left column of the Chamber weekly email calendar (distribution of 4,000) may be placed for $150 per week ($100 for members). Ads include a logo and up to 25 words, subject to Chamber staff editing. Ads, unfortunately, won't be sent for review, though will be rerun for free in case of any Chamber errors. Camera ready jpgs may also be sent. Aim for a horizontal ad, around 460w x 60h size. Please submit your advertisement application here. Send questions or submissions to Amy Alexander at amy@richardsonchamber.com. Pricing starts at $200 per month for your banner ad to be placed across the website. For an additional $50, we will create your banner for your organization (includes logo, 25 character limit, and one review). If you would like to create a banner yourself, the default size for the banners will be 460w x 60h. Please submit your advertisement application. Contact Allen Wise at amy@richardsonchamber.com for more information. If you think you have a topic that would be of interest to the membership, you can post to the LinkedIn group Richardson Chamber of Commerce. This group is only for Chamber members. Access the group here. See the Shop/Dine web page for more details about this weekly email sent on Fridays to residents who have signed up. The program is ads only. 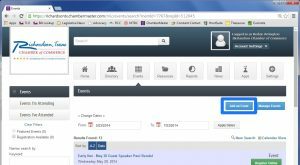 ChamberMail is a comprehensive marketing program that incorporates direct mailer that reaches all the new homeowners within Richardson with mailings monthly. We mail to the next 2000 new residents or for a year, whichever comes first. Click here to contact ChamberMail about becoming part of the program. An enhanced directory listing costs $25/year. Contact Amy Alexander to set up. Everyone loves a good deal. The Chamber can help make sure everyone knows about it. Feature your best deals and sales in the "Hot Deals" section of the Chamber website. It's quite simple! Simply upload your "virtual coupon" information, and let everybody know what's hot this week. Hot deals are a link in the upper right of the Chamber website. To submit a hot deal, log in to the Member Center. If you are the primary rep, on the left column, click on 'Hot deals.' In the main content area will be 2 blue buttons, one that says 'Add hot deal.' Input your details and submit. 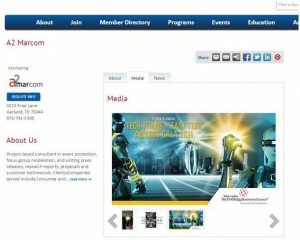 Chamber members may submit up to 3 events per year to the Chamber online calendar on the home page. 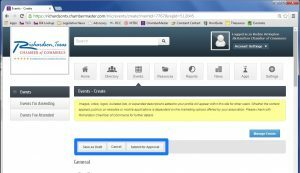 Non-Chamber events are noted with an asterisk (*) and are subject to Chamber staff editing and approval. Events that conflict with Chamber events will not be approved. Email Amy Alexander at amy@richardsonchamber.com to check on the status of your submission. For instructions on how to create your own event online, see below.